Your little girl can try on party dresses at our showroom in Purmerend! Do you want to buy a party dress for your little girl but would you like her to try it on first? Then you are welcome at our showroom in Purmerend! 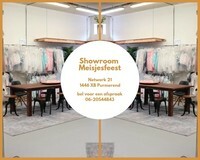 At our showroom, you can browse the complete Meisjesfeest collection and have your girl try on multiple dresses. Become inspired by party dresses for girls by LoFff, Derhy, Creamie, Happy Girls en Bonnie Jean. During a session at our showroom, the atmosphere is relaxed and personal and you will be assisted by our founder Margreet. Whether you are looking for a bridesmaid dress or an outfit for Eid Ul-Fitr, you will find what you are looking for! On Wednesday between 2PM and 6PM, everyone is welcome at our showroom. During these walk-in’s you can come by without an appointment to try out our party dresses for girls. Keep in mind that we are closed on some Wednesday. Always check our opening dates at the bottom of this page. Come by the showroom for an outlet sale! In our special outlet clothing racks, you can find party dresses for girls with high discounts. When you visit our showroom, you can browse these racks and find the best bargains. When you find something you like, you can take it home! In our showroom, you can pay by card or cash.